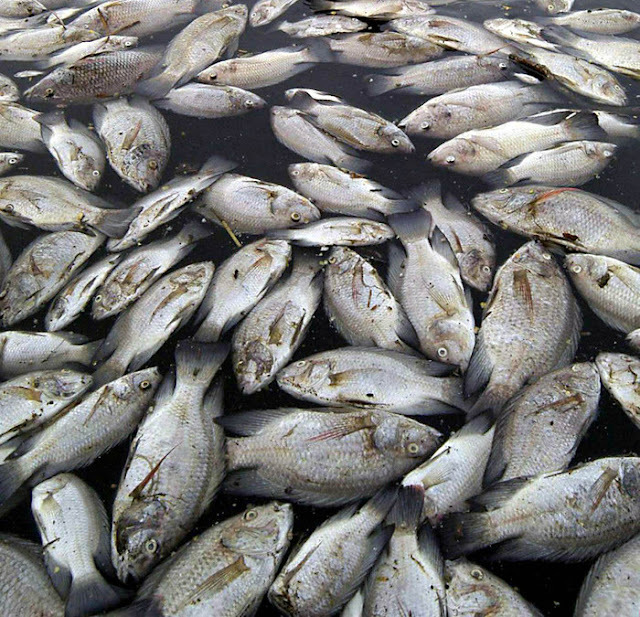 On Wednesday Telstar Online reported a massive fish kill in the waters of Nootdorp, Netherlands. Sewage in the water was thought to be the reason but the experts are not quite sure. On Tuesday CBCNews, reported hundreds of dead fish wash ashore in Prince Edward Island, Canada. Islanders may have noticed dead fish washing up on beaches but it isn't anything to be alarmed about. Parks Canada says the dead gaspereau that have been showing up this spring died from natural causes? Really? Look at the picture below, does this look natural to you? 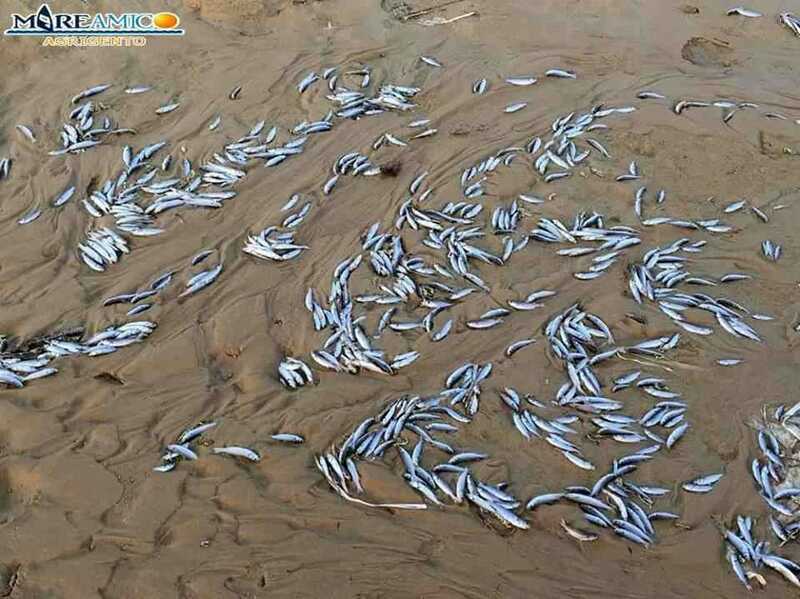 On Sunday Chronicle reported hundreds of dead fish wash up in the waters of Porto Empedocle, Italy. Tons of slurry was thought to be responsible. Last Sunday Portland Press Herald -Reported hundreds of thousands of dead fish found washed up in Brunswick Bays, America. Hundreds of thousands of dead pogies, a type of fish used for bait, have appeared along the shores of Middle and Maquoit bays in Brunswick, police said Sunday. 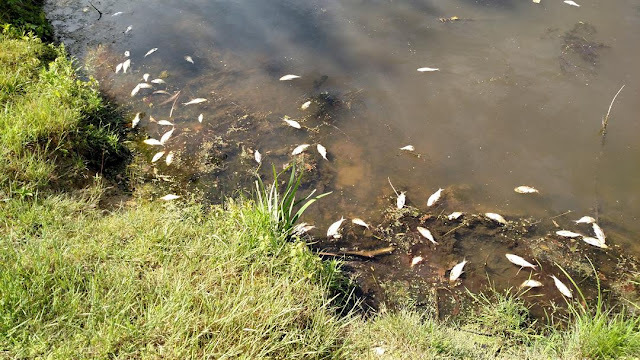 The Brunswick Police Marine Resource & Harbor Management Division said it was following up on numerous complaints of “hundreds of thousands of dead fish” in the two bays. Commissioner Patrick Keliher of the Maine Department of Marine Resources explained to the division in an email that the floating dead fish were the result of an incident in which a fishing vessel in the intertidal areas had been unable to handle such a large catch. On Friday - Journal da Bairrada thousands of dead fish found in a river in Oliveira do Bairro, Portugal. On16th June 2017 CBSDetroit - Hundreds of dead seagulls found along a road in Detroit, America. Test results have come back on hundreds of dead seagulls spotted along Jefferson Avenue in the Delray neighborhood near the Rouge River Bridge. The Michigan Department of Natural Resources says the ring-billed gulls have chosen an area near the Waste Water Treatment Plant to nest, just off the Detroit River, so a larger number of the birds are in the area compared to previous years — about 10,000 compared to 5,000. Residents speculated that a number of young birds died because they couldn’t fly and were hit by passing traffic. But the DNS says no evidence of trauma was found on any of the birds during their testing. Italian police on Friday pulled out over 300 kg of dead carp and catfish from the Reno River in Bologna. The fish are believed to have died because of an ongoing drought and the hot water in the river due to a recent heat wave. Many fish were also found gasping for breath on the surface of the river. 15th June 2017 wfmj.com - Hundreds of dead fish wash up in a lake in Ohio, America. Ohio - Neighbors around Westwood Lake in Weathersfield are wondering what is killing hundreds of fish in the lake. Dead fish have drifted into the shoreline, while others can be seen floating on the lake. Experts are looking into it. 14th June 2017 Wide Open Country - Massive amounts of fish 'mysteriously' washing up dead along the coast in Dead fish in Texas, America. In this video I am in Matagorda staying on a river channel that leads into the gulf and all of a sudden a huge amount of menhaden started to surface and then die. Pretty soon there were miles of menhaden washing up and dying along with other bigger game fish.